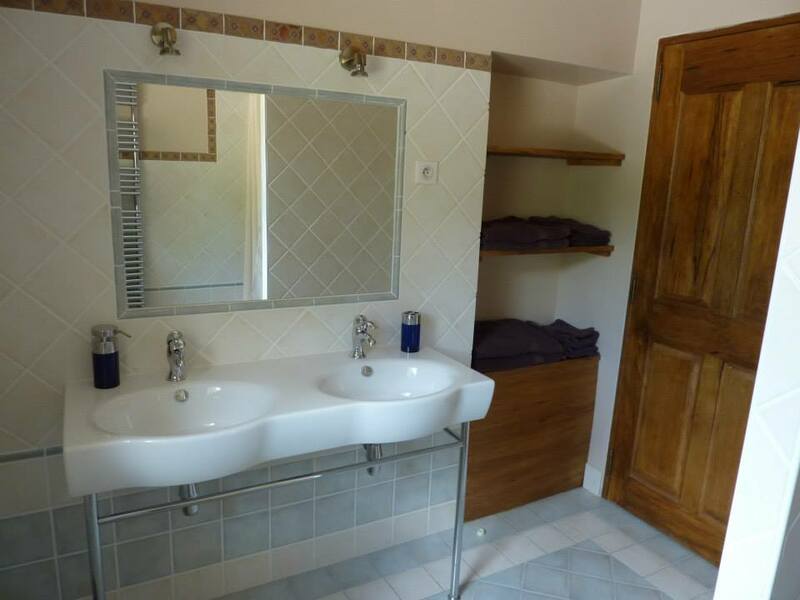 It is in the heart of the Drôme Provençale, 20km from Nyons capital of the olive and apricot that you will live a stay of well being and rest. This cottage of 150m2, adjoining the stone house of the owners, can accommodate 6 people. You will have three bedrooms, a living room, a kitchen and two bathrooms. All these rooms are spacious. The swimming pool is located in a private garden facing your covered terrace. You will discover the markets of Nyons, Dieulefit, Buis les Baronnies and Vaison la Romaine. Athletes will be delighted to practice our hiking trails and mountain bike trails. The spacious lounge-library is bathed in light thanks to its three doors. All the interior walls of the house are worked with colored plaster to bring softness and character to this building. Sofa and leather armchair and wooden furniture highlight the red brick tile. A Godin stove offers the pleasure of a wood fire on winter evenings. The glass and wrought iron table invites to the conviviality in the center of a kitchen purposely decorated with charm and simplicity. 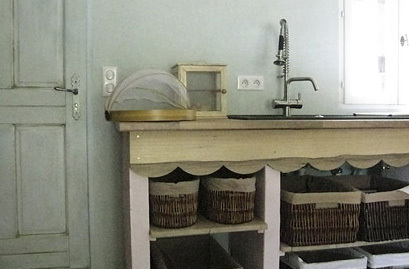 It is clear and functional equipped with a sink two bins, a dishwasher a large refrigerator freezer and various storage (two warehouses and large wicker baskets). The large bathroom is reserved for rooms Cerise and Nectarine. Tiled floor and wall. A niche in the background receives the terry towels provided by us; you can add your toiletries. The must of this bathroom: an Italian shower and a double sink in the old ..
On the ground floor, a laundry room is at the disposal of the tenants. Washing machine, dryer and shelves for storing equipment and maintenance products, table and iron. The antique wardrobe and the dark wood bedside tables give this room a rustic and nostalgic perfume of our grandmother’s rooms. The boutis olive and cherry color warm the whole. This room in sunny tones reminds us of the ripe and sweet fruit of our Provence markets. Happy marriage with the two small cabinets and night tables patinated in a shade of gray and bluish gray. Its stone wall gives it all its charm. The screened wardrobe, night tables and pastel colored boutis make this room the most romantic room.